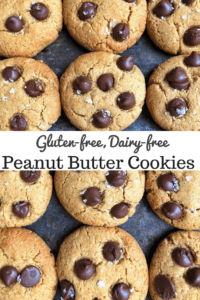 Homemade Healthy Peanut Butter Chocolate Chip Cookies which are made gluten free, are packed with nutrients, and will be your new favorite snack or after dinner dessert. I’m a cookie fanatic recently and I’m not sure where this came from because I normally would choose everything besides a cookie for dessert (hello, ice cream!). But recently, I need to have cookies stocked in my house at all times. 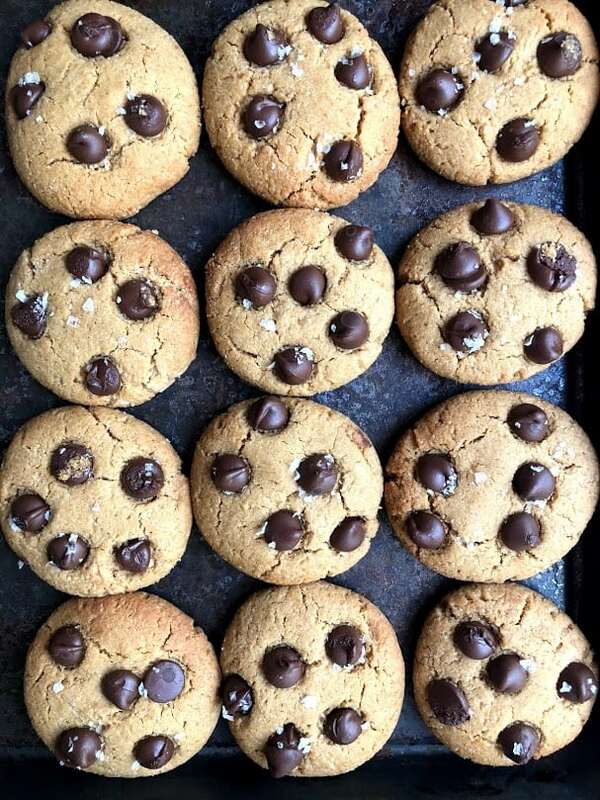 I think part of it is because when I was making my flourless sea salt almond butter cookies, I retested them time and time again that we had so many cookies to eat up, so I got really used to eating them everyday. This post is currently being sponsored by the two chocolate cookies that I’m eating right now and will hopefully be on the blog soon. Whenever there is a party or one of my friends is having some sort of gathering, I always offer to bring the sweets because there is most likely a chance that I probably have something on hand anyway, but 9 times out of 10, I’m bringing cookies. They are always the best to transfer to parties because who the heck is going to bring an entire cake unless it is someone’s birthday?! Plus they are just easy, and people can grab them while doing other things. One hand for cookies, one hand for champagne? I think so. 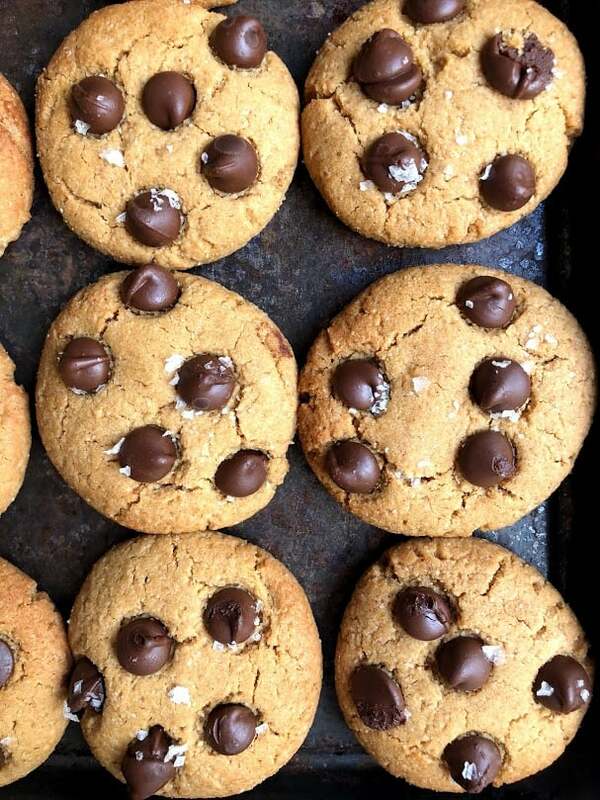 They are SOFT pillows of heaven. If you don’t want to use peanut butter you can sub any other nut butter! Trust me when I say that everyone in your life will be very grateful for you if you make these and decide to share with them. 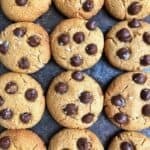 Homemade healthy Peanut Butter Chocolate Chip Cookies which are made gluten free and are packed with nutrients will be your new favorite snack or after dinner dessert. Preheat the oven to 350F and line a baking sheet with parchment paper or silicone liner. In a medium bowl, mix together almond flour, coconut flour, and baking soda. In a large bowl, mix together peanut butter, coconut oil, coconut sugar. Add dry ingredients to wet, adding in splash of almond milk if too dry. Use a cookie scoop and place dough on parchment paper. Bake in oven for 12-15 minutes or until slightly golden brown, adding sea salt after taking out of oven.